See for yourself: all we’ve done is highlighted in green, and what we haven’t — in red. Launched the main token UTN (https://lnd.im/utn), which is used for all the operations inside Universa blockchain; with a help of UTN it is possible to transfer any value instantly and almost free. 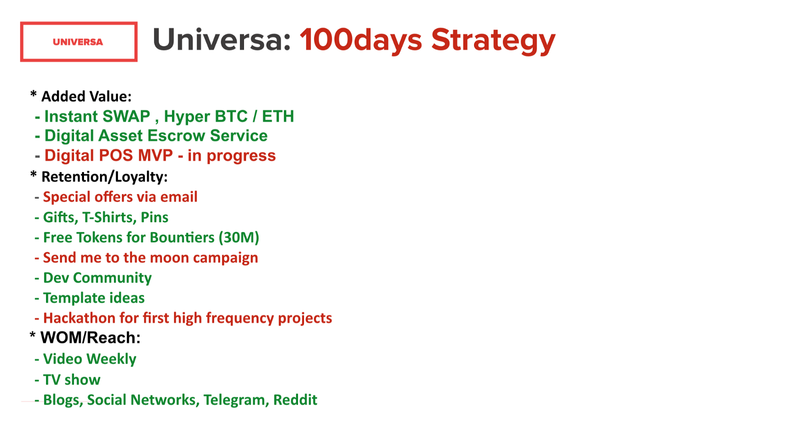 Launched HyperTokens and instantSWAP — ultraBTC/ultraETH (https://medium.com/@borodich/weeks-18-19-hyper-tokens-ubtc-ueth-4bf12b81c27) — a basis for stable coins. 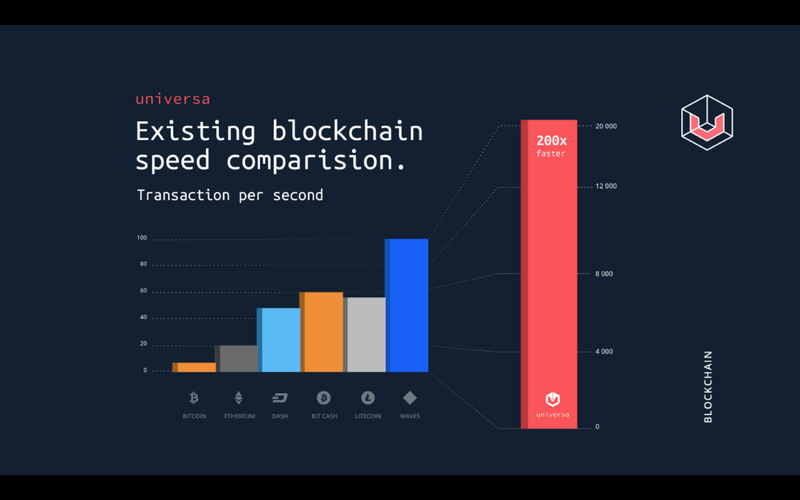 As we seek a jurisdiction for the fully functional stable coin, you can use our groundworks to work with a fast Bitcoin or for Bitcoin-to-Ethereum exchange with Universa escrow. 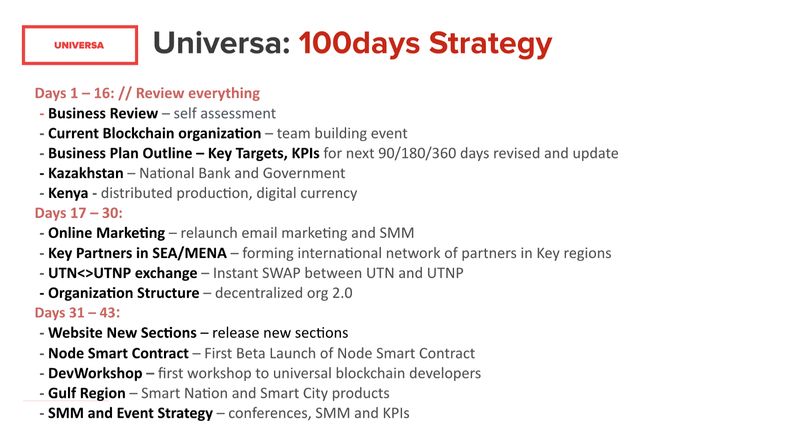 So, in the next 100 days we have to complete the financial and legal structure, relaunch marketing, release developments which were started in the beginning of the year, and establish offices in the regions which are crucial for us (South-East Asia, China, Kazakhstan, Middle East, Africa). Good luck to us and thank you all for your support! 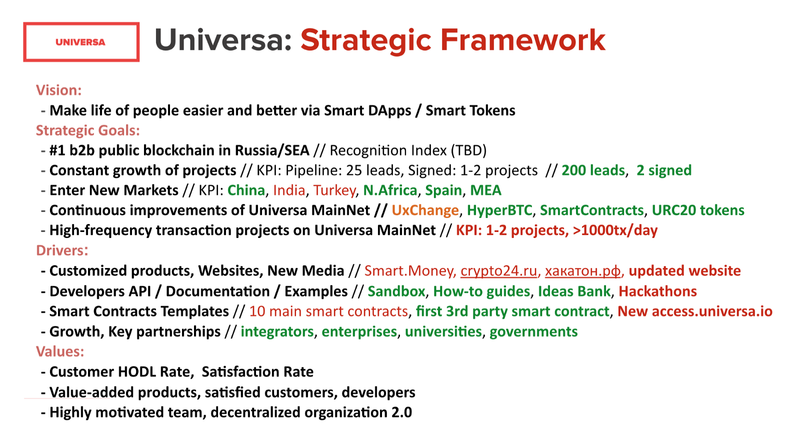 We are always happy to answer your questions in the Telegram group — t.me/uplatform (EN) and t.me/universa (RU). 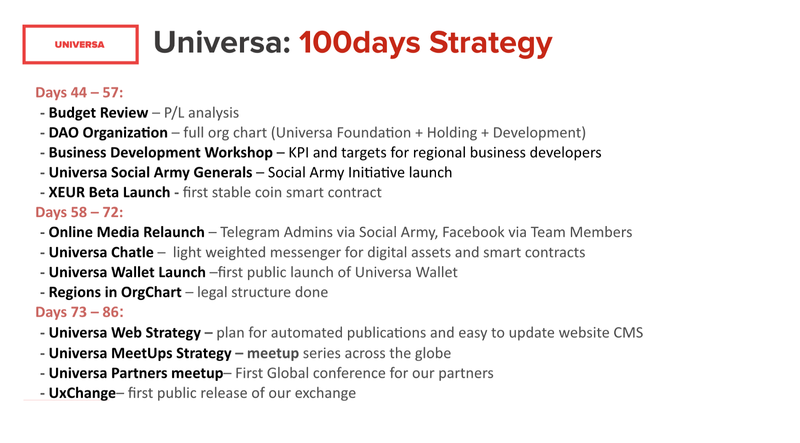 Universa Blockchain - simple, fast and reliable blockchain protocol for business and apps. The Token Sale has succeffully finished on 08/12. Stay tuned for the updates!